A form of media art that has emerged in the past several years referring to mixed reality projects, often done with more lo-fi technologies, locative media generally tends to converge wireless and mapping technologies such as cell phones and GPS. Locative media has been attacked for being too eager to appeal to commercial interests as well as for its reliance on Cartesian mapping systems, yet if these critiques are well-founded, they are also nostalgic, invoking a notion of art as autonomous from the circuits of mass communication technologies, which we argue no longer holds. This essay begins with a survey of the development of locative media, how it has distanced itself from net art, and how it has been critically received before going on to address these critiques and ponder how the field might develop. As our concept of place expands to the network of relations between humans + humans, humans + things, things + things, "place" becomes mobile, virtual and contingent. Ubiquitous. A tree falls in a forest. A transponder tag embedded in its bark transmits its position to a reader-device that sends the information through middleware to a database on the internet. The tree’s location and data about its condition are conveyed without requiring human line of sight. No one hears, no one sees the tree; the forest is a place fully accessible to data-mining without need of human perception or intervention. This is not science fiction (although Bruce Sterling’s spime is nearly that); the thing—once only a material object, a commodity, a fetish valued by humans—is becoming a sentient node of communication; dust is smart, glass is smart, phones are smart. Humans are dumb and dumber. The Internet of Things, published by the ITU (International Telecommunications Union) in 2005, declares a “new era of >ubiquity ? beyond the “ubiquitous computing ? of networks available anywhere anytime for human-to-human (H2H) connectivity to an Internet reliant on connections between humans and things (H2T) and between things themselves--Thing to thing (T2T) communication circumvents the communicative networks between humans. The Internet is emerging as not only a network between anyone but between anything. There is a robust philosophical tradition of musing about “the thing, ? its nature and its culture. Martin Heidegger opens his short essay, “The Thing ? (1950), with a commonly-claimed assertion about transport and media technologies: “all distances in time and space are shrinking. ? He forecasts the philosophical consequences of an impending technological change: “the peak of this abolition of every possibility of remoteness is reached by television, which will soon pervade and dominate the whole machinery of communication. ? What Heidegger’s 1950 essay took to the furthest reaches of philosophical parsing, the 1951 science-fiction horror film The Thing (directed by Howard Hawks from a screenplay by Hawks, Charles Lederer and Ben Hecht) extrapolated to camp hyperbole. At a military outpost near the north pole, scientists detect an abberation in their instruments, they find a space craft below the ice, attempt to destroy it only to discover it contained a passenger, an 8 foot frozen alien. “An intellectual carrot. The mind boggles, ? quips a scientist aghast at the potentially deadly intelligence of the partially-thawed object. General Motors tests vehicle-to-vehicle (V2V) collision-avoidance systems that endow automobiles with a “sixth sense ? foreboding imminent collision. A transponder signals the car's position, speed, acceleration, and braking action to other any similarly-equipped vehicle, up to a quarter-mile away. And yet the GM system only fosters communication between GM cars. Cars ‘speak’ digitally to other cars but in a manufacturers dialect with a key security flaw. A “foreign ? car could attack undetected using the existing tactics for vehicle-to-vehicle engagement—a sudden crash. In a 1928 essay entitled “The Conquest of >Ubiquity ? (1928/1934), French poet and cultural critic Paul Valery forecast yet-unrealized networks of media delivery. Valery’s rarely-read text registers only dimly on the horizon of cultural criticism because it served as an epigram for Walter Benjamin’s now canonical “Work of Art in the Age of Mechanical Reproducibility. ? Benjamin’s essay--which has acquired remarkable >ubiquity as the ur-diagnosis of twentieth century cultural change —drew directly on Valery’s insights into the changing value of the work of art once it was removed from its place of origin and delivered elsewhere and everywhere. Whereas Benjamin’s interest was in the loss of aura of the artwork when replaced by its mechanically-reproduced other, Valery was instead struck by the conduits of connectivity as images and sounds would enter the home as a utility, as water, gas, or electricity. As geographies and temporalities are reconfigured by the ever-more efficient spatial-temporal mash-ups of media and their delivery platforms, the CONQUEST OF UBIQUITY seems an apt assessment of the goals of both tech-design and social engineering. In Heidegger’s assessment:“despite all conquest of distances the nearness of things remain absent. ? Is a network a place? Is place a network? French anthropologist Marc Augé distinguishes “places ?-- encrusted with history and social life-- from “non-places ?-- spaces of transition not location, without history or social life. Highways, airports, airplanes, shopping malls may perform as conduit-places embodying the locative paradox of neither “here ? nor “there ? but the place in-between. And although Augé designates highways/motorways as “non-places, ? let’s recall for a moment the discarded metaphor of the “information superhighway. ? This vaunted “superhighway ? was an artery carrying data in two directions at high speeds, producing a new sense of place-- a cyberspace-- with new addresses and identities. The highway metaphor was soon redolent with the exhaust of cliché as speed-bumps, traffic jams, tollroads, advertising billboards helped to sour both utopian promise and descriptive panache. But a decade later, the internet is encrusted with history and social life; the network is a place. And as real highways become smarter, automobiles smarter, our mobile devices smarter, the inanimate boasts new intelligence, turning tables on our concept of the table itself. "Enlisting their help we may set eyes on far-off places without so much as leaving home; we traverse impassable ranges, cross rivers and seas in safety; without provisions we range over the whole world; by the power of imagination we swiftly journey East-West and North-South at a single glance. What greater delight than with our very own eyes to survey the realms and conditions of kings, princes and dukes; to know the positions and remoteness of cities and villages; to have studied not merely the rivers, harbors bays and capes of different countries but the character and customs of their different regions and peoples... --From our printing press, January 1, 1665"
The atlas and the printing press mapped and disseminated exotic elsewheres and Others as part of the cartographic episteme of virtual travel. The introduction to the Atlas Maior emphasizes the requisite visuality of such arm-chair site-seeing. The "geo-spatial web"/"internet of things" is engaged in a very different representational project. Information is mapped (willfully or not) onto elsewheres and others (chairs, tables, automobiles, dogs, infected birds, terrorist suspects) that have as little subjectivity as the indigenous Other was granted. This formerly "inanimate" Other can now communicate back (about its location, condition, needs) either willfully or not. Does the chair want to tell us about its history? Does the terrorist suspect want to elude our tracking? In The Internet of Things, the RFID and sensor technologies offer a “shortcut to >ubiquity. ? The RFID is a product-tracker; it pulses deep in the warehouses of Walmart, the Amazonian rain-forest, the bourgeois home. It is a passive tag, activated by its reader. For the 2005 Ubiquitous Computing conference I helped run a workshop on Pervasive Image Capture and Sharing and I put in a position paper on "Intimate Visual Co-Presence." After our discussions of locative media, I realized that it is an example of mapping relations between personal and spatial relations. Basically, it is a riff on some of the earlier work I did with Daisuke on technosocial situations like "ambient virtual co-presence" that were being supported by ongoing, lightweight text message exchange. With the advent of camphones, photos have entered this stream of exchange. Christian Licoppe has been talking about similar dynamics in terms of "connected presence." The idea of ongoing lightweight connection is a common refrain in mobile society research, but the addition of visual information adds an interesting twist. The just-released Windows Live Local has stunning aerial pictures. 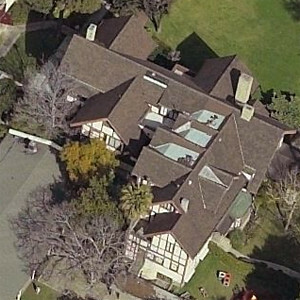 Look at the Annenberg Center from above. These angled aerial shots are much more understandable than the usual 'straight down' satellite pictures. Must be the shadows and perspective that give a sense of volume and make things easier to recognize. LA Weekly Article "Digital Universe with LA at its Center"
Net Publics Julian Bleecker is mentioned in an article on the new media scene in LA in this week’s LA Times. Even more interesting than the article is the rancorous discussion it set of on LA new media artists and their relation to the military/education/entertainment complex. You can read the discussion here. And here is a post that didn’t make it onto the list.